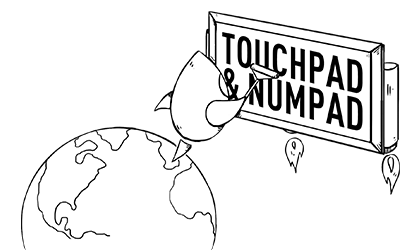 Today we release an all new version of TouchPad and NumPad. For both, this update represents a major overhaul of the code base, design changes, and new features. It also represents a significant change to the business model of both apps. Split-view support. Both apps are now universal, and fully support split-view on the newer iPad models. This of course brings NumPad to the iPad for the first time, and it is an awesome experience for composers. Brand new themes. Whenever we overhaul code like this, we always look to see how we can better make use of modern design paradigms, and frameworks. While you don’t always get to see the underlying code changes — which I am told we should be proud of — you do see the visual changes. This latest round brings three themes to the apps: Gold, Space Gray, and Silver. All are designed to look great with your chosen device color. Better multi-tasking support. We took great care to not only support split-view, but to make sure that our apps respected the intentions of split-view. This includes better connection persistence, and faster reconnection to VNC hosts. Of course, there are many other small things you might find. Like incremental jump forward and backwards controls for Plex. More intuitive layouts for the button configurations in TouchPad. And more neat stuff we packed in there for you to find. Money is what we all want from our apps: for them to at least cover the cost of development. (Which is a lot harder than most people think.) With TouchPad and NumPad we are talking about pair of apps with a large installed base, and this being a costly update for us. Ship the upgrade as a free update, and hope we attract new users. Ship a new version of the app, like TouchPad 2, and charge for that version. You have to convince current customers to pay for an update. You have to message current customers about there being something new to pay for. Then you have the name. There’s just no way we want to tag a number on the end of the name for the sake of trying to make some more money. That’s when we realized a powerful new(ish) tool that Apple gives us: receipt checking. With that we would be able to tell whether someone is an old, or new, customer. Paid up front for all new customers. It’s the same app, so existing customers get the app update for free without having to go looking for it. New users get everything in the app for the initial cost. Current customers get everything except the new theme packs. Instead, they have to purchase the themes via an in-app purchase, or use the app with only the silver theme. In doing this, we have checked all the boxes we wanted to — by not hampering the app functionality, but still giving current users a reason to pay us a small upgrade fee and thus continuing to support the app and its development. Free for everyone (we have dropped the price of the app to free with In App Purchases). Current customers get all keyboard layouts. New customers only get the numerical layout. New customers have to buy Finale and Sibelius layouts individually via IAP. Existing customers don’t get the themes for free, and have to pay to unlock those as a way to support continued development of the app. Our hope is that by making the app free, people get exposed to what is a fantastic tool. But by charging for the more advanced music composition features, we still are able to make money. Nothing we are doing here is pushing the boundaries of technology, rather we are hoping to find another avenue for profitable, but respectful, upgrades in a system which doesn’t outwardly allow for them. TouchPad 6.0 and NumPad 5.0 are available today on the App Store and we would love for you to check them out.